Sonos’ Black Friday 2018 and Cyber Monday 2018 sales were just okay this year. While the company typically offers discounts across most of its product line, there were only three Sonos speakers this time around that got official discounts: The Sonos One, Sonos Beam, and Sonos SUB. Meh. Luckily, Amazon was running a secret sale the whole time that gave Sonos lovers two more, potentially better options to choose from. The first was a two-speaker Sonos Play:1 bundle for $298 that included a free $30 Amazon gift card. That effectively drops the price to $268 for a pair of the best wireless speakers on the planet, and that’s a whopping $81 less than the cost of a single Apple HomePod speaker! 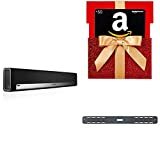 On top of that deal, Amazon was also offering a Sonos Playbar for $699 with a free OEM Sonos wall mount and a $50 Amazon gift card, which was the best (only?) deal on the internet for Sonos’ beloved Playbar. Well guess what, Sonos fans: if you thought you missed those deals amid the Black Friday and Cyber Monday chaos, you’d be wrong because they’re both still available now. What are you waiting for! ?